After a lengthy period of thorough testing, our Android digital signage solution is ready to launch. Consisting of a solid digital media playback device bundled together with digitalsignage.NET- our cloud-based software, this is the most cost-effective digital signage solution we have offered our clients. – It’s cost-effective. Considerably less expensive than SMIL and Windows-based media devices, the Android ‘box’ provides the same functionality. By using it, you will be able to display the same image and video formats as the ones supported by ‘traditional’ media players and the digitalsignage.NET version running it will enable you to schedule content and monitor your system remotely, just as before. So you will save money without compromising on quality. – It’s reliable. The solution was tested by our team for months before its release so you can be rest assured that you can build a solid, sustainable digital signage solution. – It’s easy to deploy. Simply connect the device to your screen, set the Wi-Fi connection (or plug in the Ethernet cable) and run the digitalsignage.NET application. That’s it- your digital signage solution is ready to receive and display your content. Our Android digital signage bundle is suitable for unsophisticated digital signage projects that need to be up and running quickly, without breaking the bank. To learn more about it and register your interest, please head to its dedicated web page. 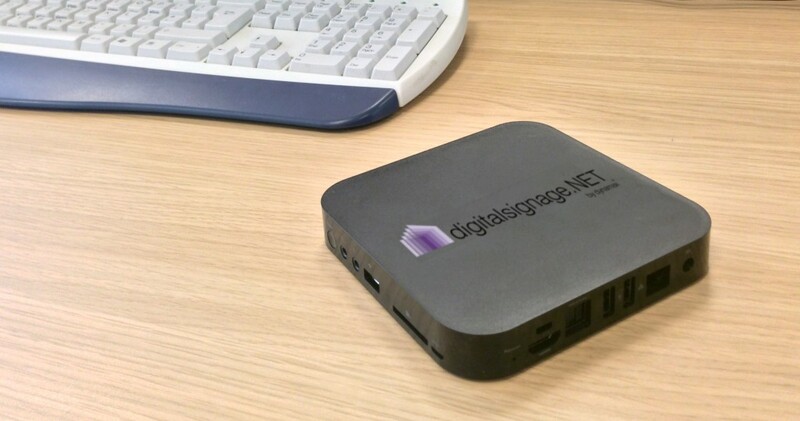 Don’t forget that you can set up a digitalsignage.NET account for free and test the software at your own leisure before going for the complete solution. This entry was posted in Digital Signage, Hardware, News, Software by Dynamax. Bookmark the permalink.